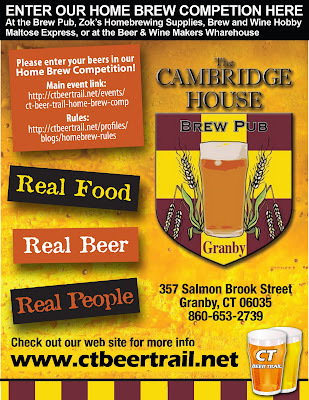 The Competition at a Glance: Cambridge House Brew Pub Granby, Zok’s Homebrewing Supplies, Brew and Wine Hobby, Maltose Express and CTBeerTrail.net are proud to present the First Annual CT Beer Trail & Cambridge House Brew Pub Home Brew Competition. This event will be held on Sunday, November 13, 2011 at the Cambridge House Brew Pub, located at 357 Salmon Brook St., Granby, CT. This competition will not be a sanctioned event, but the beers judged will reflect the categories described by the Beer Judge Certification Program (BJCP), available at bjcp.com. Only category 1-23 will be accepted. There WILL NOT be mead or cider category entries accepted. NOTE: Homebrewers must enter their beers using the standard BJCP categories, designating the category and sub category entered by the appropriate numbers and letters. The organizing committee will then collapse all entries into eight (8) distinct categories. The categories will be Light Ale, Amber Ale, Dark Ale, Light Lager, Amber Lager, Dark Lager, Belgian Strong Ale and Specialty Beer. These eight collapsed categories will incorporate all twenty-three BJCP categories. *Ex. Dark Ales will incorporate Stouts, Porters and Scottish/Irish Ales. Other collapsed groups will be similarly combined. Beers in these collapsed categories will be judged together, and the final result will reflect the individual merits of each beer. Though it may appear that we are judging apples and oranges collectively, the resulting winner of said category will stand out as a definitive beer in its style parameters. The competition organizers promise a professionally run competition with feedback for all entries. Brewers will receive comments on their beers from official BJCP score sheets filled out by judges recognized by the BJCP, professional brewers and novice judges under the direction of experienced BJCP judges, who have volunteered their valuable time. In addition to the first, second and third place winners in the eight distinct categories, a “Best of Show” winner will be awarded by a special judging panel. 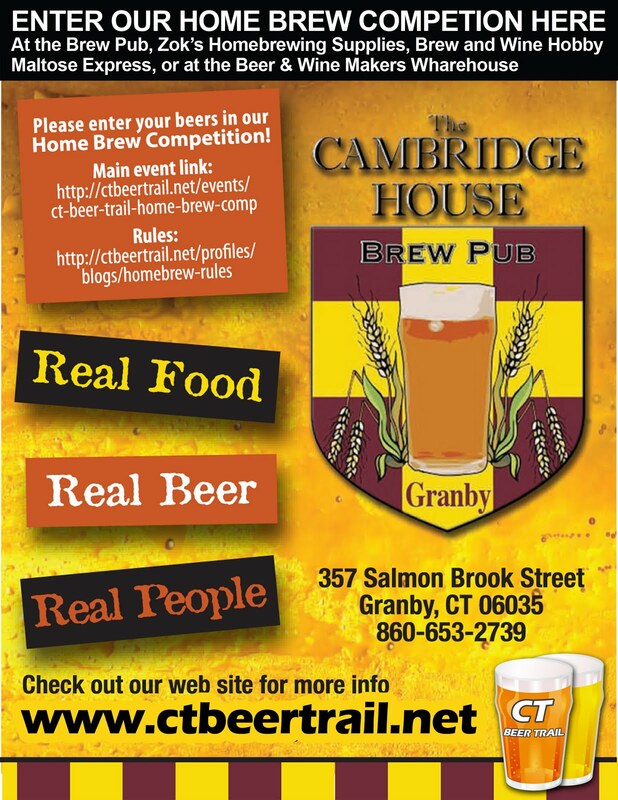 Additionally, a “Brewmaster’s Choice” award will be sponsored by the Cambridge House Brew Pub. The winning beer selected as the “Brewmaster’s Choice”, which may or may not be the “Best of Show” will then be brewed at the brewpub at the discretion of the Cambridge House Brew Pub’s owner. We will also conduct a separate judging which is strictly for novice homebrewers who have entered their beers in competition for the first time. This judging will be similar to a “Best of Show” panel, but the beers will not have to win their respective classes to be included. We feel this new award will prompt many new homebrewers to enter their beers into competition.